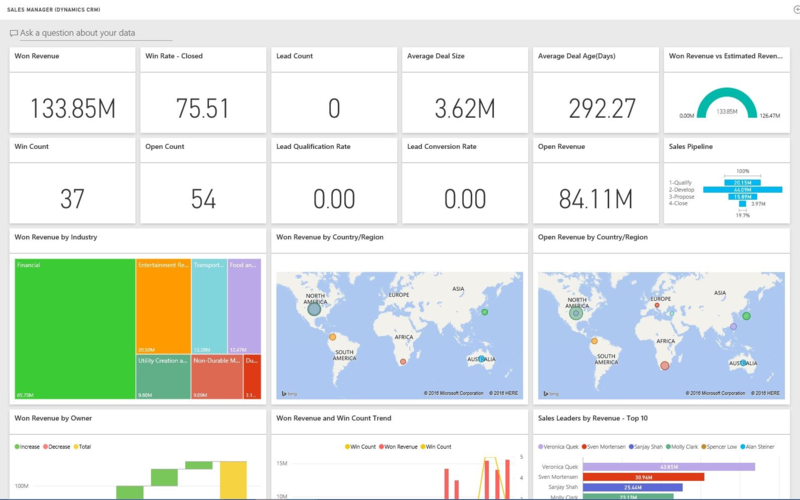 Microsoft Dynamics CRM Online for Power BI allows you to easily access and analyze your data. Power BI uses the OData feed to create a descriptive model, with all the entities and measures needed such as Accounts, Activities, Opportunities, Product, Leads, Users, and more. 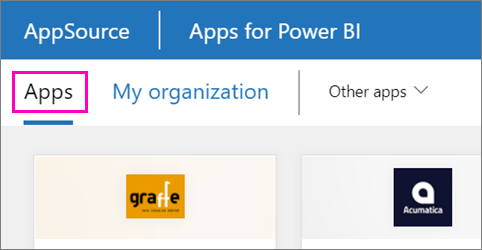 After you install the app, you can view the dashboard and reports in the Power BI service (https://powerbi.com), and in the Power BI mobile apps. 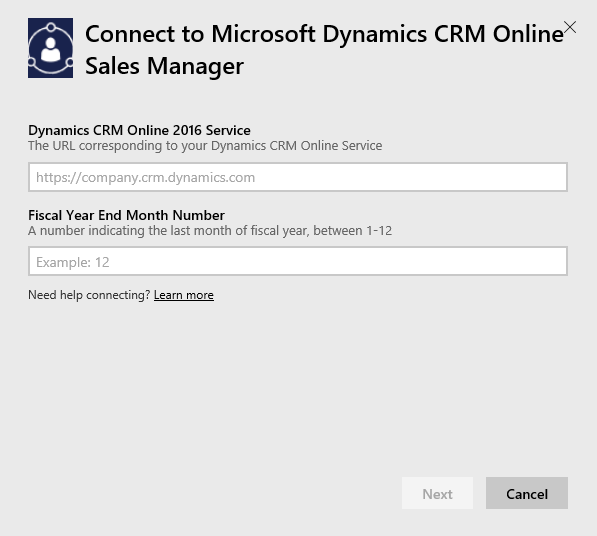 Connect to Dynamics CRM Online Sales Manager or Service Manager. Read more about Dynamics CRM Online integration with Power BI. This connection requires Microsoft Dynamics CRM Online 2016 or later. More details on requirements below. Select Microsoft Dynamics CRM Sales Manager or Microsoft Dynamics CRM Service Manager and click Connect. Provide the Service URL associated with your account. This will be in the form https://company.crm.dynamics.com, see more details below. When the import is complete, the new app will appear on the Apps page. Select Apps in the left navigation pane > select the app. You can ask a question by typing in the Q&A box, or click a tile to open the underlying report. Try asking a question in the Q&A box at the top of the dashboard. You can filter and highlight the data in the report, but you can't save your changes. Your dataset is scheduled to refresh daily. You can change the refresh schedule or try refreshing it on demand using Refresh Now. The sections below detail what's included for the Sales Manager and Service Manager personas. Data is limited based on the security role assigned to the Dynamics CRM Online user. The dashboard and reports are meant to provide operational reporting on near term data with focus on a team or group. Each query is limited to retrieve a maximum of 100K records from Dynamics CRM Online. If this limit is exceeded because of high volume of data in your organization, provisioning will fail as data refresh Dynamics CRM online will be terminated. If your account is too large, consider connecting through the Power BI Desktop to build a custom solution. Average Deal Size and more. New Leads Trend, Sales Pipeline and more. These metrics and charts help to understand your sales organization performance and analyze sales pipeline across your sales team. Following table lists the CRM entities available for this service and also gives details on the filters applied to each of the entity records. Account All accounts, which have related opportunities that have been modified in the last 365 days. Number of Times KB Article Used in cases and more. Most Used and Most viewed KB Articles and more. These metrics and charts help to understand your support organization performance and analyze active cases workload across your service team and service queues. Following table lists the CRM entities available for this service, as well as details on the filters applied to each of the entity records. Account All accounts which have related cases that have been modified in the last 90 days. Contact All contacts, which have related cases that have been modified in the last 90 days. An administrator must enable the OData endpoint in the site settings. An account with less than 100k records in any of the tables. Note if the account has access to more than 100k records the import will fail. The address of the instance can be found in the URL bar of your browser. It typically has the format: https://[instance_name].crm.dynamics.com. Power BI only supports Dynamics CRM 2016 endpoints. The connection will not work with earlier versions of CRM Online. 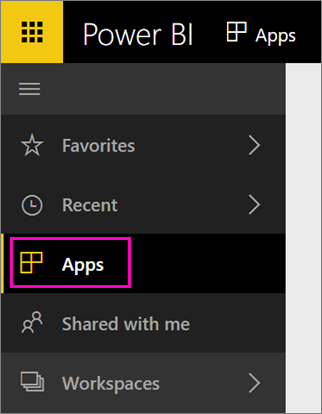 Use Power BI Desktop to connect directly to your account. 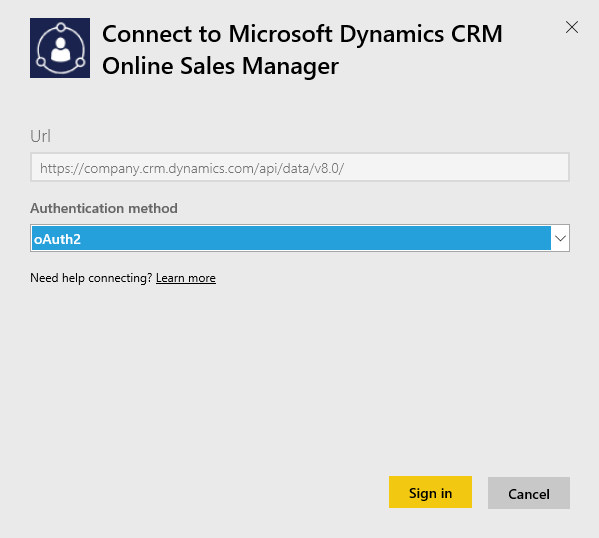 Also, try connecting directly in Power BI Desktop, with the OData URL https://[instance_name].crm.dynamics.com/api/data/v8.0/. If you confirm you have Dynamics CRM Online 2016 but you're still hitting issues connecting, contact your CRM Admin to confirm you have all available updates. If you do not have CRM Online 2016 or later, use the Power BI Desktop to connect directly to your account. If you see an error "Data refresh failed as query exceeded the maximum limit of 100000 records," consider connecting directly from the Power BI Desktop or leveraging the CRM solution template. 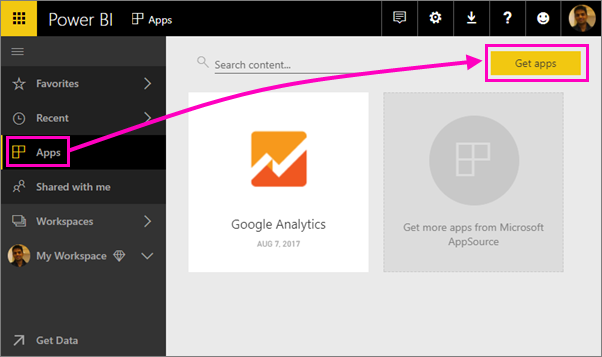 What are apps in Power BI?